CHARLESTON, South Carolina – It was inside a gigantic, and all-new, 1.5-million square-foot assembly plant that Mercedes-Benz unveiled its latest cargo van. The factory, which sits just outside of the very charming city of Charleston, in South Carolina, currently employs 900 people and represents a 500-million-dollar investment for Mercedes-Benz. The Charleston plant will act as a central nervous system for an aggressive offense to expand the carmaker’s presence in the North-American commercial fleet market in the years to come, all while allowing the 2019 Sprinter to be built faster, more effectively, and at lower costs. Also: 2019 Mercedes-Benz Sprinter: We're Heading South to Drive it! The 2019 Sprinter isn’t all-new per se, but actually an important refresh of the outgoing model. For the North-American market, two engines are offered; either an all-new 2.0-litre turbocharged four good for 190 horsepower and 258 lb.-ft. of torque, or the familiar 3.0-litre turbo-diesel V6. The latter also develops 190 horsepower, but pumps out a hefty 324 lb.-ft. of torque. The turbo-diesel four cylinder, currently sold in Europe, will not be offered in our market after all. Two automatic gearboxes can be had. Four-cylinder vans therefore come fitted with a nine-speed automatic, while V6 diesels get a seven-speed box. All four-cylinder trim levels—Cargo, Crew and Passenger—come solely with rear-wheel drive. V6 Sprinters, except Cab Chassis models, get optional all-wheel drive. Two wheelbases are offered; either 144 inches (3.6 m), or 170 inches (4.3 m). An elongated body, which Mercedes-Benz calls 170 Extended, is also available. Since we’re speaking numbers, and because it’s easy to get lost in the sheer amount of available configurations (up to 1000 in total! ), towing capacity for all Sprinter 1500s powered by the four-pot is rated at 5000 lbs. (2268 kg). 2500, 3500, 3500 XD and 4500 V6-powered Sprinters will tow up to 7500 lbs. (3402 kg). The Sprinter 4500 only comes with a dual-wheel configuration, while 3500 and 3500 XD models can either be had with a reinforced single wheel that Mercedes-Benz calls Super Single, or a dual-wheel setup. And as if things we’re already confusing enough, max payload also varies from one model to the next: 6636 lbs. (3010 kg) for Cargo, 2862 lbs. (1298 kg) for Passenger, and 7485 lbs. (3395 kg) for Cab Chassis models powered by the V6. As we’re writing this, payload capacity for four-cylinder Sprinters has still not been announced. Alright, can we Drive it Now? We attended a press conference from South Carolina governor, Henry McMaster, stating that Amazon plans on ordering 20,000 new Sprinters for its delivery fleet. After, we were treated to a guided tour of the super modern assembly plant, which uses, among other advanced technologies, augmented reality to improve welding precision. We also got a full demonstration of the all-new MBUX infotainment system, which now allows the Sprinter to be connected in real-time to a web-based / mobile app interface to help businesses better manage their commercial fleets. After all that, we were finally thrown the keys to take these new vans for a spin. With so many different available variations, it wasn’t easy to choose which model to test. I opted for a fifteen-passenger Sprinter 1500 with the 170 Extended body, the turbo-diesel V6 and rear-wheel drive. Painted all black, with equally black-tinted windows, my Sprinter resembled the private van of an NBA all-star team. 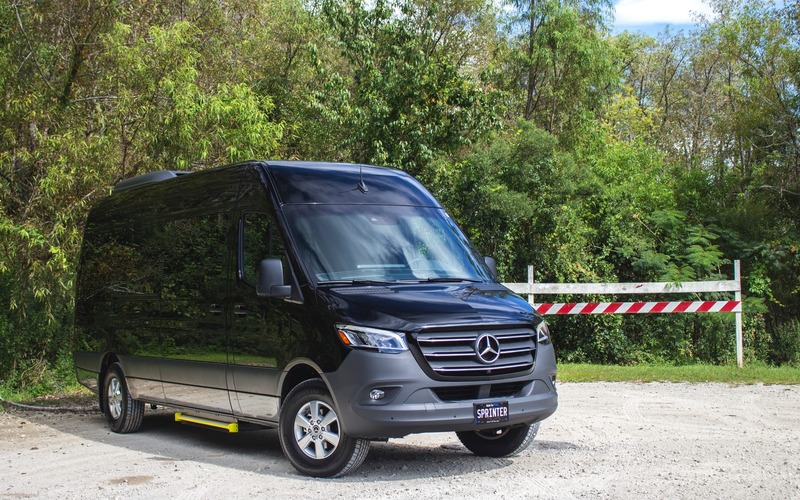 On the road, the Sprinter’s unibody construction allows it to be smooth, compliant, and refined, free of unwanted chassis wobbles or cabin bouncing normally associated with body-on-frame light-duty trucks. Actually, the Sprinter still has a frame, but contrary to your average truck, such as a Ford F-150 for example, whose body rests on top of the frame, the Sprinter’s chassis is cleverly welded into the unibody structure, allowing it to be stiffer, while still being able to execute light-duty work, and of course, exhibit a more refined ride overall. The V6 offers plenty of low-end torque, and pickup is more than satisfactory when digging into the throttle. The automatic transmission shifts smoothly and downshifts promptly, and the traditional clacking noise of the diesel engine is kept low once inside. Speaking of the cabin, it’s been heavily updated for 2019, incorporating an all-new 10-inch (seven-inch on base trims) touch-operated infotainment interface, as well as several USB ports located across the cabin so passengers can charge their beloved devices. However, we were disappointed to find only one USB-C port up front. No standard USB port in sight. The new MBUX interface is a net improvement over Mercedes-Benz’ current setup and the addition of haptic feedback make it far easier to operate. The menus have also been simplified in order to improve user-friendliness. Only downside: the fleet management connectivity features mentioned earlier will only be available in Canada in 2020. Most delivery companies already utilize similar software anyway. 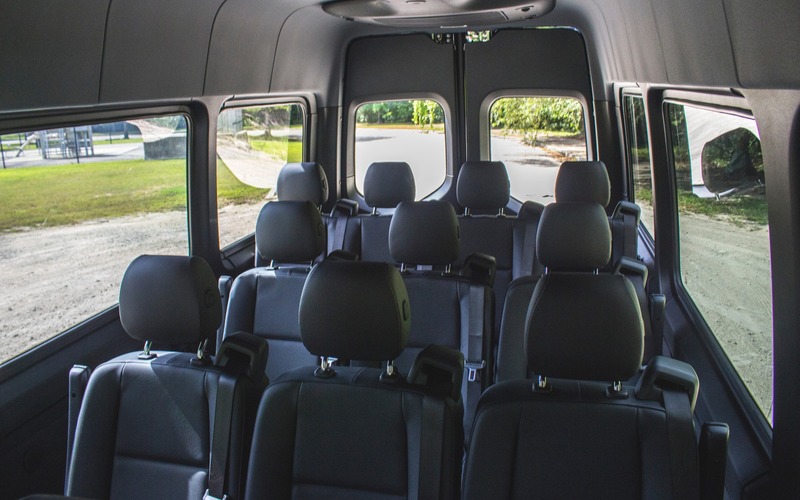 Built in the United States for the first time since it was born in 1995, the Sprinter is undoubtedly well prepared to fulfill the varied needs of cargo van buyers, all while ready to compete against established players such as the Ford Transit and Ram ProMaster. Expect the 2019 Mercedes-Benz Sprinter to hit Canadian showrooms in January of next year. With such an aggressive strategy to increase its North-American presence among commercial vehicles, things are all properly aligned at Mercedes-Benz for its Sprinter to continue to sell very well on this side of the pond. The only issue we’re seeing is the $42,900 base price, with a fully loaded Sprinter easily topping $65,000 mark. That’s significantly more expensive than a Ford, which could prove a tough sale for North-American businesses that have trusted domestic brands for decades. 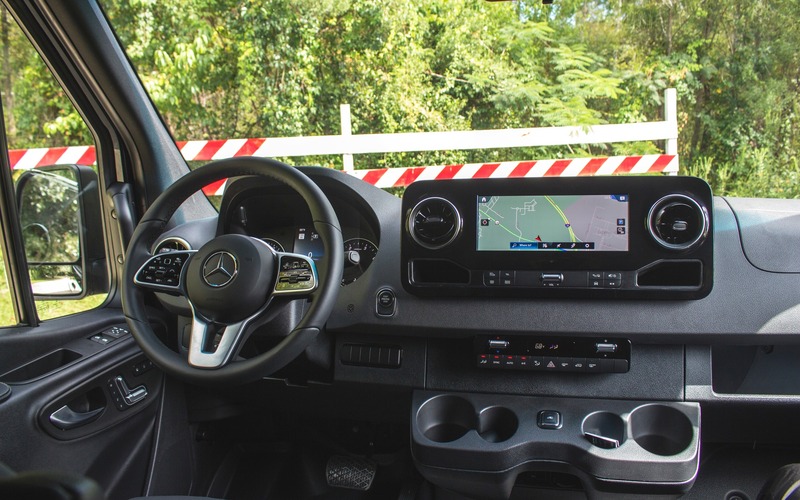 Spotlight on 2019 Mercedes-Benz Sprinter: We're Heading South to Drive it!